Bruce Gamble, the portly reserve goaltender called up as an emergency fill-in continues to be a revelation for the Toronto Maple Leafs. 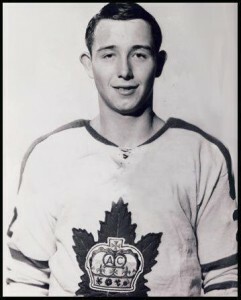 Last night, his acrobatics and a single goal by Frank Mahovlich were all that the Maple Leafs needed to down the Detroit Red Wings 1-0 at Maple Leaf Gardens. In the other two games, New York edged Chicago by a similar 1-0 score and the Boston Bruins shocked the Montreal Canadiens 3-1. 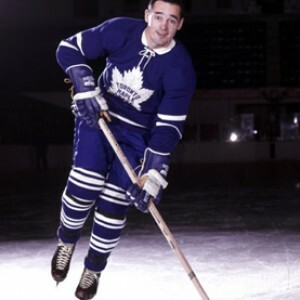 Frank Mahovlich scored the only goal of the game. 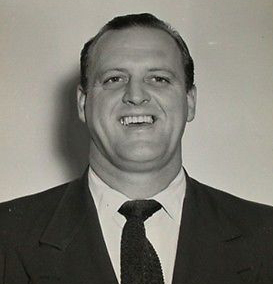 Gamble, who often flops around like a fish out of water, was unbeatable for the third time in the five games he has played since his recall from Tulsa of the Central Professional Hockey League. While his style can be described as a bit unorthodox, no one can argue with the results. Last night he made 35 saves against a Detroit club that carried the play by a wide margin over the final 40 minutes of play. Detroit had its winless streak extended to eight games. That was more due to Gamble’s antics and not anything the rest of the team did. While the Wings were by no means powerhouses, had it not been for Gamble this one could have been a Red Wing rout. The only Toronto goal came at 17:24 of the first period. Mahovlich did the honours on a four-on-three power play for the Leafs. Dave Keon won a faceoff in the Detroit zone and got the puck back to the point to Larry Hillman. Hillman fired a drive from the blue line which was stopped by Detroit goalie Roger Crozier. The rebound went right to the Big M who drove it home before Crozier could move. From there on in it was Gamble’s show. His best work was in the early part of the final frame. He stopped Gordie Howe from point-blank range with a seemingly impossible save. He then denied Parker MacDonald twice on close-in chances. 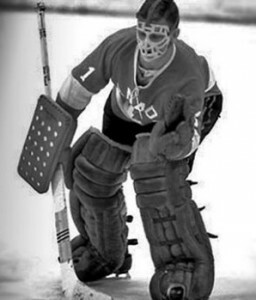 For the third game in a row, Bobby Hull was denied goal number 51 by a hot opposition goalkeeper. Last night it was Cesare Maniago of the New York Rangers who stopped everything in sight to shut out the Black Hawks and the Golden Jet 1-0 at Madison Square Garden in New York. The big problem for the Hawks is that it seems that none of the rest of the team wants to score until Hull nets that elusive 51st goal. It’s the third game in a row they have been shut out since Hull notched his 50th. The Rangers executed a simple plan last night. 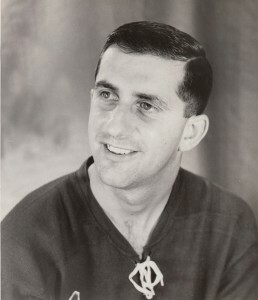 Going into the game, former Chicago forward Reggie Fleming was assigned the task of shadowing Hull while the rest of the responsibility was laid at the feet of Maniago. And the lanky netminder did not disappoint, even though he wasn’t terribly overworked. Maniago made 25 saves but his best weren’t against Hull. During the game coach Emile Francis spelled Fleming with Bob Nevin in the Hull-shadowing role and he kept the Chicago superstar off balance as well as Fleming did all night. 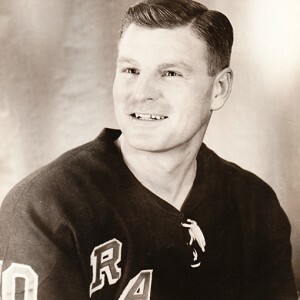 The game’s only goal scorer was Earl Ingarfield of the Rangers. He beat Hawks goalie Glenn Hall at 8:59 of the third period. It was obvious during the game that Chicago players were more concerned about setting up Hull for the record-breaking goal than they were about scoring themselves. At least five times during the night players who were in more advantageous shooting positions chose to try to feed Hull and not pull the trigger themselves. Hull did get two shots on goal, but neither was dangerous. 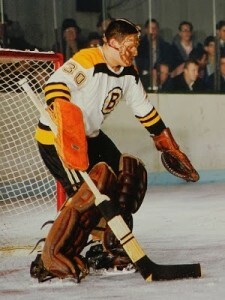 Bernie Parent, the Boston Bruins rookie goalie is only a few years removed from his formative years in Montreal. Last night he threw up a veritable brick wall in front the team he loved as a youth as his goalkeeping led the Bruins to a 3-1 win over Canadiens right in the Forum in Montreal. Parent, who seems to relish playing in front of his home-town crowd, was spectacular at times. He made 39 saves, including 18 in the final 20 minutes when the Canadiens seemed intent on putting the puck right through Parent and the net. But the youthful goaltender refused to yield. That final period saw Montreal outshoot the Bruins 18-7, but it was the Bruins who scored the only two goals of the third. Bobby Rousseau had scored for Montreal in the first period with Gilles Marotte evening things up for Boston in the middle stanza. Murray Oliver scored at 1:45 of the third to put the Bruins up 2-1. John Bucyk lofted a long clearing play into an unguarded Montreal cage in the final minute to make the final score 3-1. The Canadian national hockey team dropped a 2-1 decision to the Czech nationals thanks to a last-minute goal yesterday at the World Hockey Championships in Yugoslavia. The game was a wild one, with the officiating taking centre stage. The only goal of the first 40 minutes was scored by Czechoslovakia when Canada was two men short at 15:03 of the first. Jiri Holik scored the goal after Canadian goalie Seth Martin made a great save on a Frantisek Tikat shot. Martin has a reputation as a goalkeeping god in Europe and he didn’t disappoint the Yugoslav fans. He made a number of spectacular saves and had many difficult chances to handle. Canada thought they had taken the early lead about five minutes into the game when Ray Cadieux fired a loose puck into the Czech cage. The referee ruled that the net had been knocked off its moorings after it overturned during the scramble that resulted in the puck entering the net. Many observers felt that the puck was well over the goal line long before the net became dislodged. Things got fairly rough after that, at least for an international contest. Penalties became a problem for the Canadians and they were unable to mount any sort of sustained attack due to the various infractions for which they were fingered. The winning goal was scored by Stanislav Pryl with only 29 seconds left on the clock. That goal came after Roger Bourbonnais had tied the score for Canada at 8:59 of the third. After the game, the Canadian players were so upset over the refereeing that they voted as a group to withdraw from the tournament and simply go home. After having two goals disallowed and then receiving penalties for infractions that were far less than were let go for the Czechs, the Canadian players had seen enough. The future of the Los Angeles Blades of the Western Hockey League is still very much up in the air. 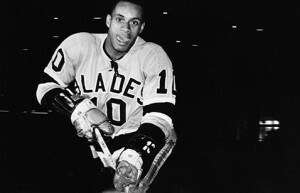 The Blades ownership had planned to transition to the National Hockey League when it expands to 12 teams in the 1967-68 season. The big league threw on monkey wrench into that idea when it awarded the Los Angeles franchise to Jack Kent Cooke. Cooke received the franchise on the condition that he fulfil his promise to build his own rink. It’s highly doubtful that he will be able to complete a suitable structure by October 1967, so that means he will have to find a place to play, at least on a temporary basis. The Blades play in the Los Angeles Sports Arena and it is more than likely Cooke will seek to lease that facility. The WHL will be holding an executive meeting in May. At that time, the Blades will have to make some sort of announcement about whether they will continue in the league for the 1966-67 season. Blades owners are also considering a lawsuit against Cooke and the NHL for infringing on their territory with the establishment of the NHL team. Until a decision is made, the Blades team and some players are in limbo. The Blades own 10 players outright. They are Marcel Pelletier, Camille Bedard, Jerry Toppazzini, Leo Labine, Buddy Boone, Willie O’Ree, Bill Orban, Bobby Schmautz and Marc Boileau. Not included on that list is Howie Young, who is Blades property but is really a questionable commodity these days. Blades general manager-coach Lynn Patrick was asked how much that group of players could command in cash. Patrick estimates that if sold off, the players could garner about $100,000 for the team’s owners. Patrick’s own future is in question as well. He came to Los Angeles with the promise that he would run the NHL franchise when it was awarded. He says he has had feelers from other organizations, but he does have a contract with the Blades through the 1966-67 season. Cooke has already tried to negotiate a lease with the Los Angeles Sports Arena Commission. The Commission wants Cooke to commit to a long-term lease, at least three years. Cooke says he will go for two years, because he feels his new rink will be ready by then. As of now, it seems there is little chance of an agreement. Pittsburgh Hornets nipped the Springfield Indians 2-1 in an AHL game last night. Murray Hall scored the winning goal midway through the third period for the Wasps. Billy Knibbs and Ted Taylor scored two goals each as the Baltimore Clippers of the AHL drubbed the Portland Buckaroos of the WHL 7-3 in an interlocking game. Four Toronto Marlboros are injured going into the second game of their OHA Junior A playoff against Peterborough. Out of the lineup are Jim McKenny, Brad Park, Cam Crosby and Tom Martin. Al Arbour of the Rochester Americans of the AHL has been sidelined indefinitely with a leg infection.